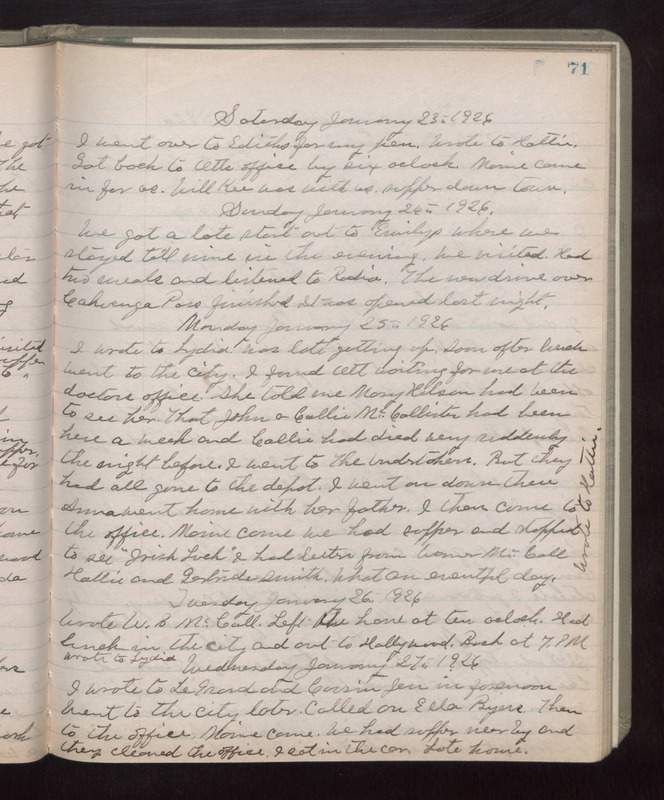 Saturday January 23rd 1926 I went over to Ediths for my pen. Wrote to Hattie. Got back to Otts office by six oclock. Maime came in for us. Will Kee was with us. Supper down town. Sunday January 24th 1926 We got a late start out to Emilys where we stayed till nine in the evening. We visited. Had two meals and listened to Radio. The new drive over Cahuenga Pass finished. It was opened last night. Monday January 25th 1926 I wrote to Lydia. Was late getting up. Soon after lunch went to the city. I found Ott waiting for me at the doctors office. She told me Mary Wilson had been to see her. That John & Callie McCallister had been here a week and Callie had died very suddenly the night before. I went to The Undertakers. But they had all gone to the depot. I went on down there. Anna went home with her father. I then came to the office. Maime came, we had supper and stopped to see "Irish Luck." I had letters from Warner McCall, Hattie and Gertrude Smith. What an eventful day. Wrote to Hattie. Tuesday January 26th 1926 Wrote W B McCall. Left the home at ten oclock. Had lunch in the city and out to Hollywood. Back at 7 PM. Wrote to Lydia. Wednesday January 27th 1926 I wrote to LeGrand and Cousin Jen in forenoon. Went to the city. Later called on Ella Byers. Then to the office. Maime came. We had supper near by and then cleaned the office. I sat in the car. Late home.